As millennial women mature and enter new life stages, their need to be more efficient increases dramatically. Balancing a career, motherhood, or other responsibilities with their daily routines can be difficult, and therefore they seek out ways to make their lives easier whenever they can. One way to make things more efficient is to shrink the distance between inspiration and action and from content to commerce by reducing the roadblocks between discovering new beauty and personal care products and purchasing them. As more and more millennial women consume beauty content via their mobile devices, the need to create a streamlined and frictionless content-to-commerce experience grows in importance. As part of the POPSUGAR Insights study "Beauty Evolved: How Millennial Women Shop for Beauty and Personal Care," we explored the concept by asking women to let us know how interested they are in using universal-checkout-style tools to help them easily purchase beauty and personal care products from multiple retailers via their mobile devices. In general, there was tremendous interest in this concept, and 91% of millennial women indicated that they are interested in using a website or mobile app to allow them to purchase products from different stores at the same time using a single checkout. Millennial women were more likely than women 35 to 49 (85%) to be interested in universal checkout. 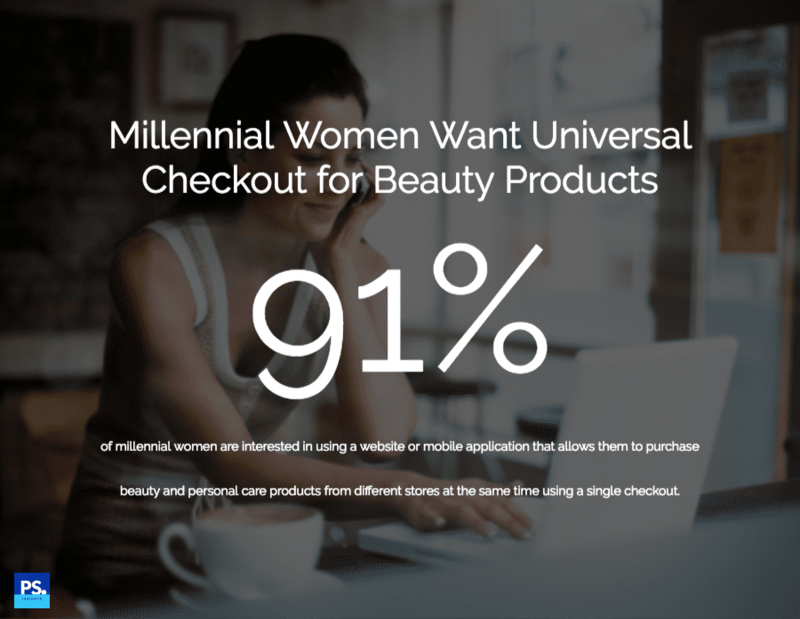 Interest in frictionless commerce solutions like universal checkout aligns with what millennial women say constitutes an ideal beauty and personal care shopping experience as well. When we asked millennial women to describe their ideal shopping experience, the top responses all related to the speed and simplicity of the experience, with words like "easy," "simple," "fast," "quick," and "convenient" being mentioned hundreds of times. Ranked below words and phrases related to creating a more seamless experience were more financially themed concerns, such as "inexpensive" or "cheap" products and "free" or "reduced" shipping costs.